As of December 18th, Venezuelan president Hugo Chavez remains in stable condition as he continues to undergo cancer treatment in Cuba. The Venezuelan government reported that Chavez, 58, had recently suffered a respiratory infection but is now resting. Chavez remains in Cuba and is recovering from another surgery to fight cancer that is believed to be in his pelvis. This is Chavez’s fourth operation since last year. Chavez first announced he had cancer in June of 2011. Chavez underwent a surgery for a pelvic abscess and had a baseball-sized tumor removed. Last February, he underwent another surgery when a tumor reappeared in the same area. He has also undergone months of chemotherapy and radiation treatments. Chavez has kept secret many details of his illness, including the exact location and type of the tumors and cancer. Due to the aggressive nature of his cancer, Chavez has named Nicolás Maduro as his successor. In the days before this most recent procedure, Chavez had announced that he needed to have another surgery because tests showed that malignant cells had reappeared in the same area of his pelvic region where tumors were previously removed. Chavez cautioned the Venezuelan people beforehand that the surgery would present risks. Shortly after the fourth surgery took place, Vice President Maduro spoke on Venezuelan television and reassured the citizens that the procedure had been a success. Maduro also assured the public that Chavez’s vision for Venezuelan would live on, even as their leader remained incapacitated by cancer. The precarious state of Chavez’s health has sparked quite a bit of debate over what will happen to the face of the Venezuelan government if the President dies shortly into his fourth term. The Venezuelan constitution states that, should the president leave office in the first four years of his term, an election must be held within 30 days. 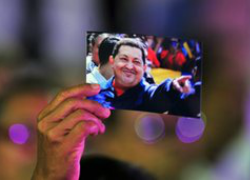 Chavez has encouraged Venezuelans to vote for Vice President Maduro in the new election should his health fail. However, many of Chavez’s supporters distrust Maduro and fear the President’s demise because no one else would be capable of replacing Chavez. As debate stirs over the future of Venezuelan politics, Venezuela’s political divide deepens. Chavez defeated his political opponent, Henrique Capriles, and was re-elected as the country’s president for his fourth term this October. Despite looming health concerns, his inauguration is scheduled for January 10, 2013. Gaby Corica is a 3L at DU law, Staff Editor for the Denver Journal for International Law and Policy, and General Editor for The View From Above.